Video can provide an innovative way to present your brand. This is an excellent way to feature representatives from your company to discuss or demonstrate your products or introduce your company’s philosophy. A short impactful video can add visual impact to your overall marketing campaign. 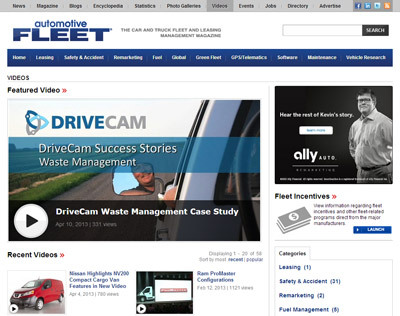 This is a featured video that has been on AutomotiveFleet.com. Featured videos have great visibility on the site and are linked to from the homepage as well as newsletters. They work well with a single video or could also be done with a series. This is an example of a video player for Nailsmag.com. The playlist is organized into several relevant topics and works when many videos will be supplied at once.